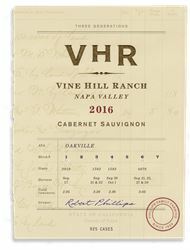 VHR, Vine Hill Ranch Cabernet Sauvignon, an artisinal wine from our family's vineyard in Oakville, is the culmination of the Phillips family’s evolution from grapegrowing to winemaking over three generations. Growers since 1959, Vine Hill Ranch has farmed the finest Cabernet Sauvignon winegrapes for leading Napa Valley vintners. The inaugural release of the 2008 VHR, Vine Hill Ranch Cabernet Sauvignon fulfills our desire to create a singular wine from our seventy acre vineyard nestled at the foot of the Mayacamas Mountains. VHR is a tribute to Vine Hill Ranch and its 125-year farming heritage. VHR, Vine Hill Ranch is certified under the Napa Green Winery Program by the Napa County Department of Environmental Management (DEM) and the Association of Bay Area Government’s (ABAG) Green Business Program and completed all the regulatory components needed for environmental sustainability. These components included developing water and energy conservation methods, preventing pollution, and reducing solid waste. In addition to developing sustainable winery practices, this program is set to become the standard for the state of California. VHR, Vine Hill Ranch is certified under the Napa Green Certified Land Program. VHR, Vine Hill Ranch has created and implemented a customized farm plan with measured results that addressed all aspects of its property, vineyard land as well as non-farmed land, including practicing soil conservation, water conservation, stable drainage, riparian corridor enhancement, fisheries and wildlife habitat enhancement and long-term improvement and sustainability.